Growing up in the southernmost part of India, my friend and I would often pass the potter’s house on our way home from school. Stopping to rest under the tall coconut tree in front of his shop, we would watch intently as he and his wife made their clay pots. Numerous times I stood there mesmerized as he took a lump of clay and began spinning it on his wheel. Soon that which was formless turned almost magically into a beautiful and usable vessel. Quite often I would observe that what he was working on became marred. Yet the potter was never as disappointed as we were. He knew his craft well. He simply took the piece off the wheel, kneaded the clay again and started over. This next time it seemed to me the new creation surpassed the one previously attempted. In Jeremiah 18, the Lord had His prophet watch a potter go through this exact same routine. Then God spoke through His servant, saying, “Like clay in the hand of the potter, so are you in my hand, O house of Israel” (Jeremiah 18:6). These words were intended as both a warning and a message of hope that in spite of repeatedly messing up, God could still make something beautiful of this nation. All of us have been on God’s wheel only to be taken off and repeatedly remolded. Who can’t identify with these lines? Too often, however, we fight the potter, sometimes sinning grievously in the process. More often than we care to admit, our flaws have been exposed in the protracted process of becoming what God has in mind. Probably the same thoughts and desperate emotions marked Adam and Eve after hearing the words, “You must leave the Garden,” knowing that Paradise was lost at their hands . . . the same for Samson when he was captured and blinded by the Philistines . . . the same for John Mark when he was kicked off the missionary team. This is precisely when the devil implements one of his most devious strategies. The enemy isn’t really as concerned about our sin as he is our response to it. His intent is that through our collapse, we will simply give up. So he seeks to discourage us to the point at which we lose all hope and even the desire to try anymore. As I look back on past experiences when I know I failed, it seems the devil always showed up promptly, trying to make my mess ups seem worse in my mind than they already were. “You’re a hopeless case,” he would whisper, attempting to drown me in discouragement. You see, he’s “the accuser of our brethren, who accused them before our God day and night . . .” (Revelation 12:10, NKJV). Many times when I’ve failed, I’ve felt like I should just toss in the towel. Resign. I’ve also felt like the worst husband or the most unfit father. Secretly, I wished someone else would just assume my responsibilities, because I certainly didn’t believe I was doing a good enough job. But remember that this hellion is a notorious liar. Jesus called him “the father of lies” (John 8:44). God’s desire is that through our failure we will allow Him to make us into useful vessels that far surpass the beauty we had before. But this doesn’t mean we have to see ourselves as accepting God’s second best for our lives. Our failures don’t warrant us to live by Plan B rather than the first choice of Plan A. That’s not how He thinks. It’s true that sin has its price to pay. But that doesn’t prohibit the Lord from doing what He wants through the lives of His children. God remains forever able to fulfill His perfect plan for us. Remember, I said perfect plan, the best plan, not the second best. God sees the end from the beginning and knows all things before we even enter the scene. His perfect plan remains. Was it the devil who introduced that reduced-to-second-best concept? I know this may be hard for some people to believe right now, but I write the truth—God is in the business of making miserable failures into beautiful demonstrations of His mercy and grace. His ways are above ours. Far above! His original purposes for us are not lost. The next time it seems the locust and cankerworm have eaten the fruitful life you once knew, look up (see Joel 1:4, KJV). Even if you doubt who you are and how you acted, please don’t doubt who He is and how He acts! When you wake up to the scattered remains of your once-beautiful world looking for strength to carry on, know that this is not the end. When unexpected storms of severe criticism, slander or even being blacklisted bruise the reed—I tell you the truth, hope still remains. 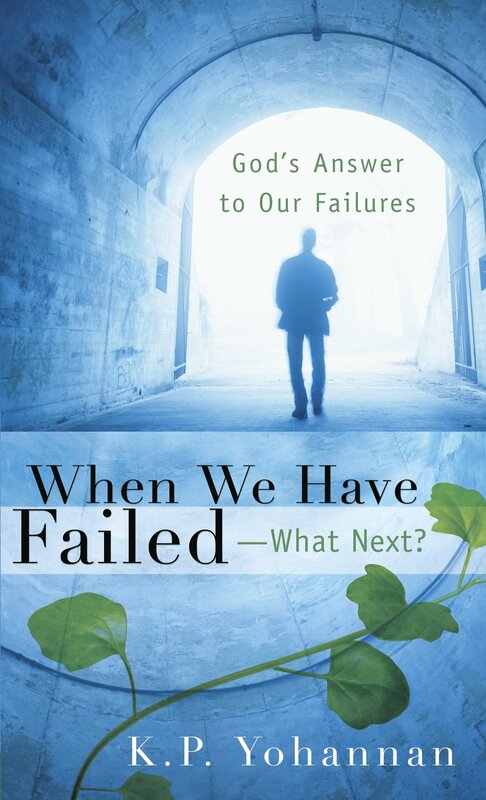 The next time you fail and wonder whether God is still able to make something—something even better than before—out of your life, you need to know that the answer is 1,000 times, YES! Confident in His skills, God is still totally capable of making everything better. Never doubt the ability of the divine Master Potter to beautifully refashion flawed pieces. He’s been doing it since the beginning of time. © 2006 by KP Yohannan, the president and founder of Gospel for Asia. It was written with the intention of encouraging and edifying the Body of Christ. To learn more about Gospel for Asia or to receive additional free resources, visit Gospel for Asia’s website. This entry was posted in When We Have Failed - What Next? and tagged abortion, Bible, cancer, Christianity, Discipleship, encouragement, Failure, gfa, Gospel for Asia, holy spirit, Hope, hopeless, Jesus, Jesus Christ, K.P. Yohannan, Missionaries, Missions, sickness, suicide, trinity on April 29, 2010 by gfaseo. I Can’t Believe I Did That! Chapter 2: I Can’t Believe I Did That! Growing up in a respectable family in his community, Roy led a life of affluence with a bright future before him. His father, a successful medical doctor, was so proud when his son decided to enter medical college. Then right before his eyes, all that looked so promising began to collapse like a deck of cards. A new school brought him new friends. But these colleagues were living on the edge, and their company took Roy on a downward spiral. After only two years in medical college, nothing seemed to be going right. He was into drugs, and with his new pastime, his health began to waste away and his grades were slipping—he was failing. To top it off, this wayward student found out he was going to be fathering a child. His world was falling apart around him. His parents got wind of his wild life and were completely devastated. Roy found himself shaking his head saying, “I just can’t believe how it all happened.” In essence, he was saying, “I can’t believe I did this!” Then when things could not get much worse, Roy’s best friend, who had always been there no matter what, jumped off a 12-story building and committed suicide. Can it get any worse? I believe there is a key New Testament personality who would answer, “Yes, it can!” Maybe we should look briefly at a mortifying part of his story as told in all four of the Gospels. Peter replied, “Man, I don’t know what you’re talking about!” Just as he was speaking, the rooster crowed. The Lord turned and looked straight at Peter (Luke 22:54–61, emphasis mine). What a horrific moment that must have been. The Son of God had heard Peter’s hot words of denial, and after listening, Jesus, the prisoner, turned and looked straight at His disciple. What a dreadful turn of events for Peter. In his wildest dreams, he never would have believed himself capable of what he had just done. We know this was traumatic for him, because the passage reports that “he went outside and wept bitterly” (Luke 22:62). Maybe it was a divorce that threw off your normal equilibrium or a marriage that underwent severe stress. Perhaps it was a business failure that made your life so wretched or an important relationship in which miscommunication and hurt feelings took over. Could it have been the belief that you failed someone important, even yourself? You fell so far short of your personal expectations. Whatever it was, you couldn’t believe this was happening, not to you anyway. Certainly Peter’s earlier words, “Lord, I am ready to go with you to prison and to death” (Luke 22:33), came back to mock him. Each of us starts out in life with desires, ambitions and dreams, plus the early commitment and resolve to achieve them. But somewhere along the way, whether by our own deliberate choice or by external circumstances, these aspirations come crashing down before us, crumbling in our hands. There we sit in the ruins, replaying the various destructive scenes and moaning at the appropriate times, “If only that didn’t happen!” Regret clings to our every thought as we struggle to stand with knees made weak by our own choices. That’s where Peter was stuck in his thoughts. Earlier he had so triumphantly announced that Jesus was the Son of the living God. Yes, he was one of those in the “inner circle” closest to his Lord. He even miraculously walked on water. And it was to him that Christ talked about that rock upon which His Church would be built. But he had just denied the very One he earlier declared to be the Messiah, the man he had said he would follow to the very end and even die for. So much for all his big talk. Jesus had heard with His own ears Peter’s strong statements of denial. How could this happen . . . to Peter? We all have had those feelings. We think, “How could I have done that? I know better than this. I should have learned by now.” Deep inside we have the defense that we are better than the wrong we committed. In spite of rationalizing and trying to minimize our failure, guilt gnaws at our heart. We sink as we consider what we have done. Yet as followers of God, we know that upon repentance we can experience firsthand His marvelous mercy. Why then do we feel this shadow over us? Jesus has taken our blame, the charge against us, the sting of our failure. Then why are we so sick about our failure? Because we thought we were better. We regret that our “report card” does not show all the “good marks” we want others to see. But all the best marks of our own righteousness can only amount to “filthy rags” as the prophet Isaiah says in Isaiah 64:6. They will never be anything we want to showcase. The only righteousness worthy of displaying is the righteousness of Jesus that we have through His powerful and precious blood. If what we hang on to is filthy rags, why grasp for it anymore? Why mourn over the loss of it? Will we be like the criminal who until the very end esteemed and held on to “his own righteousness,” although obviously it was nothing to boast in? I consider everything a loss compared to the surpassing greatness of knowing Christ Jesus my Lord, for whose sake I have lost all things. I consider them rubbish, that I may gain Christ and be found in him, not having a righteousness of my own that comes from the law, but that which is through faith in Christ—the righteousness that comes from God and is by faith (3:8–9). Let us leave our rags behind and hold on to His riches. Back to Peter—little wonder this giant of a man ran, brushing aside any outstretched arms that would stop him, to a place outside where he could openly sob his heart out. Crying can be therapeutic. The genuine tears of a naughty child usually quickly touch the heart of a loving parent. When we are truly saddened by what we have done to hurt the heart of our Savior, those tears of remorse can lead us to repentance. Being vulnerable through them can help bring us to the place of looking Christ in the eye, knowing He saw and heard everything, and telling Him how sorry we are. Too bad Judas didn’t understand this truth. Scripture reports that he was “seized with remorse” (Matthew 27:3). Unfortunately, instead of going to his heavenly Father, he “went away and hanged himself” (Matthew 27:5). If you have never asked Jesus to be Lord of your life, He is waiting for you with open arms. He has long awaited the time to forgive you of all that you have ever done and draw you into His embrace. He sees your heartache. He wants to wipe away your tears and give you a fresh start. Don’t harden your heart like Judas and walk away. Simply believe that Jesus is the Son of God, who never sinned, who died for the consequence of your sins and rose to bring you life eternal. Ask Jesus to forgive you of your sins; then commit your life and all that you have into His care and direction. Remember Roy? That was not the end of his story. After his friend’s death, he too considered suicide. But that same week he miraculously heard a Christian radio broadcast. He listened to God’s Word, and he too found restoration in Jesus Christ. His life completely changed. His sins and wild life were forgiven. What looked like a life that was lost, became a beacon of light to many. He married the young lady who was pregnant with his child and finished his schooling. Then he went to one of the hardest regions of North India as a doctor ministering to the poor, bringing his skills and the message of Jesus Christ. Many people have found hope through Roy’s life. For Peter, at that moment when his eyes met the eyes of Jesus, he did not know the end of his own story. He could not comprehend the incredible manner in which Jesus would rise from the dead. He didn’t foresee his own restoration taking place on a beach in Galilee a few weeks later. He wasn’t yet able to envision the miraculous growth of the New Testament Church and the strategic role he would play in that narrative. All he knew at that instant was how he was spiritually washed out. Countless times our sovereign and gracious God has heard the bitter cries of His people after they have sinned in ways they never imagined possible. Countless times the Master Potter has shown His great skill as He remolds these vessels into expressions of His glory. Do you believe that the One who did this for Peter 2,000 years ago can still do the same for you today? He who did it then still does it today. What He did for others, He will do for you. Take that step: Believe Him. This entry was posted in When We Have Failed - What Next? and tagged abortion, Bible, cancer, Christianity, Discipleship, encouragement, Failure, gfa, Gospel for Asia, holy spirit, Hope, hopeless, Jesus, Jesus Christ, K.P. Yohannan, Missionaries, Missions, sickness, suicide, trinity on April 27, 2010 by gfaseo. This entry was posted in When We Have Failed - What Next? and tagged abortion, Bible, cancer, Christianity, Discipleship, encouragement, Failure, Gospel for Asia, holy spirit, Hope, hopeless, Jesus, Jesus Christ, K.P. Yohannan, Missionaries, Missions, sickness, suicide, trinity on April 22, 2010 by gfaseo. Although this is obviously not a true story, how many of us desperately wish we could in their entirety forget the failures of our past? So many of us don’t experience joy in its fullest because we are still tethered to the sins of yesterday. We cannot change the past no matter how wishful we may be. We can, however, learn from it. That’s certainly better than being held captive to its regrets, setbacks and problems. Every morning you awake to a new gift— the gift of today. It is my prayer that through this booklet you will be freed to let go of yesterday—learn from it, yes, but also let go of it—and then to embrace today. For today is full of hope. “ ‘For I know the plans I have for you,’ declares the LORD, ‘plans to prosper you and not to harm you, plans to give you hope and a future’ ” (Jeremiah 29:11). I believe this small booklet is one of God’s ways of extending hope to you right now. Please reach out and receive its truth. May God bless you. This entry was posted in When We Have Failed - What Next? and tagged abortion, Bible, cancer, Christianity, Discipleship, encouragement, Failure, gfa, Gospel for Asia, holy spirit, Hope, hopeless, Jesus, Jesus Christ, K.P. Yohannan, Missionaries, Missions, sickness, suicide, trinity on April 21, 2010 by gfaseo.